This really cute project from Mandy over at Sugar Bee Craft Edition really has me wondering one thing. If you make something really amazing like this monogramed mirror with the pieces, do you still get the 7 years bad luck for breaking the mirror? Even if it doesn't, it still might be worth it to have such a fun and unique piece in your house. 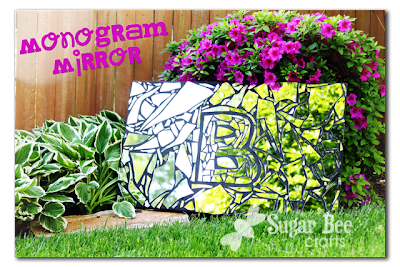 You can see how Mandy created this monogramed mirror HERE. Ok. Now that is awesome! I definitely want to do something like that! Hang up in our room or something.